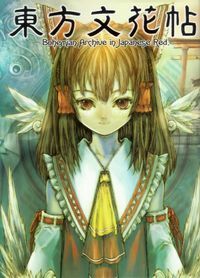 Touhou Bunkachou (Word Flower Album) ~ Bohemian Archive in Japanese Red (東方文花帖　～ Bohemian Archive in Japanese Red) is the first official Touhou book released on August 11th, 2005. It is a collection of articles written in-universe by Aya Shameimaru for her newspaper, columns by ZUN on some of his music, an interview, and fan comics. A CD featuring music, wallpapers and a demo of Phantasmagoria of Flower View is included with each copy. 2.1.4 Music Columns "Musical Sense of Illusion"
Bohemian Archive in Japanese Red includes characters, events, locations and music from the Touhou Project games 6 to 9 (Embodiment of Scarlet Devil, Perfect Cherry Blossom, Immaterial and Missing Power, Imperishable Night and Phantasmagoria of Flower View), as well as characters from Curiosities of Lotus Asia and Touhou Sangetsusei, and comments on music from ZUN's Music Collection (Dolls in Pseudo Paradise, Changeability of Strange Dream and Ghostly Field Club). The last part is an interview with ZUN about game design. Each of the principal articles is character-specific and divided in two parts. The first consists of Aya Shameimaru's initial written report, describing an event of some sort and the central character's involvement therein. The second part is an interview with said character after the report's publication. All articles were written between season 113 and 120 (see the Gensokyo Timeline). Other columns include a "Guide to Notable Locales in Gensokyo", in which Aya describes popular locations, and so-called "Special Feature Articles" describing the incidents that took place in the covered games. While the Bunbunmaru Newspaper articles are all written by ZUN and are part of the series canon, the comics in the latter part of the book are strictly fanwork. The only canonical comic is the one present at the beginning of the book ("Extra of the Wind"). Bohemian refers to "a person who lives in a very informal way without following accepted rules of behaviour". Archive means "a collection of historical documents or records", or in this case, "a collection of Bunbunmaru Newspapers". Finally, "Japanese Red" can refer to "the color of red lacquer-ware", or even "the color of a tengu's face". So, the title essentially means "a collection of newspaper articles written by a free-living tengu". Touhou Bunkachou (東方文花帖, "Eastern Album of Words and Flowers") is a term that has come to be associated with works starring Aya Shameimaru. Additionally, bunkachou (文化庁) can refer to the Japanese Agency for Cultural Affairs. pg. 18-19: Marisa — "In a String of Successive Midsummer Burglaries, the Culprit was Photographed in the Act"
pg. 20-21: Sakuya — "Treasure Hunter Races the Night"
pg. 22-23: Kaguya — "Eientei Hosts Lunar Capital Expo"
pg. 24-25: Eirin — "A New Dream Medicine for Modern Gensokyo"
pg. 26-27: Alice — "Large Number of Straw Effigies Found in Forest Behind Shrine"
pg. 28-29: Letty — "Spring-Summoning Ritual Held to Counter Prolonged Cold Wave"
pg. 30-31: Yuyuko — "Mysterious Flower Petals Beneath the Cherry Trees"
pg. 32-33: Lunasa — "Sudden Location Change at Poltergeists' Concert"
pg. 34-35: Merlin — "Is the Middle Prismriver Sister Going Solo?" pg. 36-37: Lyrica — "In Search of New Sounds"
pg. 38-39: Youmu — "Phantom Procession on a Midsummer Afternoon"
pg. 40-41: Yukari — "Youkai Practices Animal Abuse"
pg. 42-43: Ran — "Width of the Sanzu River Calculated"
pg. 44-45: Chen — "The Village of Cats"
pg. 46-47: Rumia — "Demon Lurks in the Dark in Broad Daylight"
pg. 48-49: Remilia — "Crimson Rainbow and Angel Wings on the Ground"
pg. 50-51: Three Fairies — "Strange Reversed Rainbow in the Summer Noon"
pg. 52-53: Flandre — "Enormous Shooting Star Explodes in Mid-Air"
pg. 54-55: Keine — "The Truth about the Enigmatic History Society"
pg. 56-57: Mokou — "Suspicious Fire in the Bamboo Forest"
pg. 58-59: Mystia — "Night Sparrow's Promising New Operation"
pg. 60-61: Wriggle — "Insects' News Service Starts"
pg. 62-63: Cirno — "Ice Fairy Eaten by Giant Toad"
pg. 64-65: Tewi — "Audacious Donation Fraud"
pg. 66-67: Reisen — "Rabbit Horn League Protests Shrine Banquet"
pg. 68-69: Meiling — "Mysterious Pattern in Flowerbed"
pg. 70-71: Patchouli — "The Great Out-of-Season Setsubun Festival at the Scarlet Devil Mansion"
pg. 72-73: Suika — "The Midwinter Moon's Great Explosion"
pg. 74-75: Rinnosuke — "Mysterious Luxury Item Arrives at Kourindou"
pg. 76-77: Reimu — "Flower-Viewing Continues at the Shrine"
pg. 78-79: Scarlet Mist Incident — "Mysterious Scarlet Mist over Gensokyo"
pg. 80-81: Spring Snow Incident — "Petals From Heaven in the Spring of Silver Snow"
pg. 82-83: Night Parade of One Hundred Oni Every Four Days — "Three-Day Pandemonium"
pg. 84-85: Eternal Night Incident — "The Night Without Dawn"
pg. 86-87: The Sixty Year Cycle Great Barrier Incident — "Peak Flower-Viewing Time Continues in Gensokyo"
Music Columns "Musical Sense of Illusion"
pg. 88: About the Music Column "Musical Sense of Illusion"
This page was last edited on 4 April 2019, at 17:55.